A Prophecy Written In 1907 About Obama Coming True 5 Days Before Trump Inauguration? In 1907, a book was published called "Lord of the World." This book is about a U.S. Senator named Julian Felsenburgh, who quickly ascends to become "President of the World." Felsenburgh has unusual parallels with Obama including that they are both U.S. Senators, both charismatic speakers, and both have visited Paris for major conventions. Felsenburgh visited Paris and presided over a peace treaty as Europe spiraled into chaos. There was rioting in the streets, people dying, and protests, yet Felsenburgh quells all of it with his promise of peace. Last year, a major convention was organized surrounding the hoax known as climate change. This was nothing more than a reorganization of the world toward a new order. It was not about the climate. Now, Obama appears to be pulling the strings behind a push for peace among Israel and Palestine. Firstly, he instructed Samantha Power at the U.N. to abstain from a vote condemning Israel for building settlements. Secondly, he orchestrates a Paris convention involving 70 countries gathering together to discuss peace in the Holy Land and a two-state solution. The catch is that neither Israel nor Palestine will be at the meeting. They will be completely removed from direct conversation with the 70 countries. Perhaps a two-state solution will be accomplished without Israel of Palestine present. In the novel, Lord of the World, we also meet another character named Father Francis, a Roman Catholic who leaves the church and joins Felsenburgh's new world religion. This religion is a combination of mother goddess worship and Freemasonry. Felsenburgh is, himself, a 33 year old Freemason who hates organized religion, especially Christianity. After he takes power, he orders Christians to be killed if they do not renounce their faith. We should be questioning if a 1907 prophecy is coming to life right now. 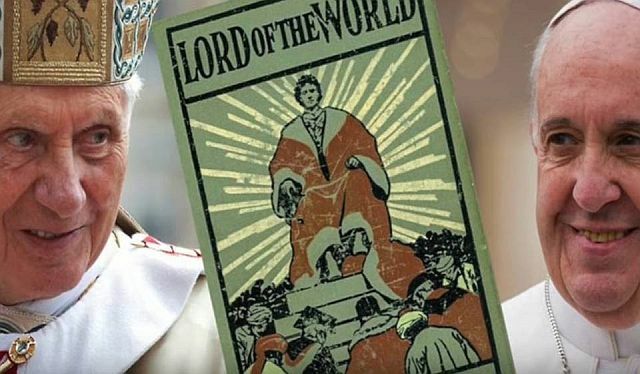 Several people, including a former pontiff, have suggested that "Lord of the World" is a prophecy in the form of a narrative. Pope Benedict 16 called the novel prophetic while Pope Francis encouraged people two read it. He stated that the book portrayed the transition of the world toward the "globalization of hegemonic uniformity." He neglects to tell the audience that this uniformity is achieved through great violence, death, and destruction carried out by the Antichrist, Julian Felsenburgh. ". . . Through great violence, death, and destruction . . . "; the same methods used by religions, I.e., Catholic Church, to unite the world under their rule.